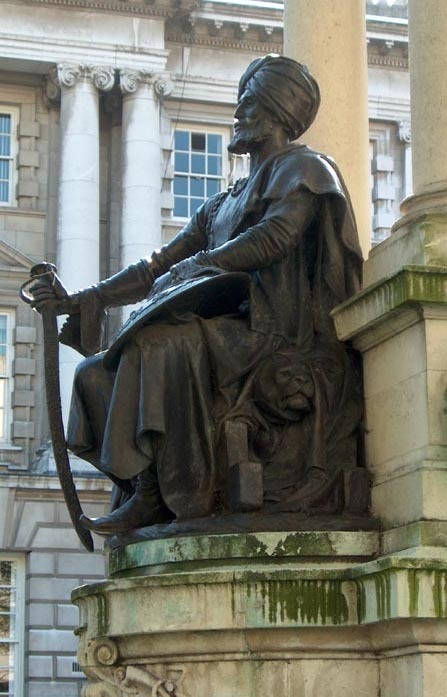 According to Brett, Pomeroy pays tribute to "local baron-made-good" (55) with a monument that represents him "enshrined in a miniature version of City Hall, his guardian figures represent[ing] his posts at either end of the Empire": the turbaned and sabred Indian sits on a cannon. while the Canadian voyageur sits on a dead moose. Brett feels that the magnificently self-confident statue of the Marquis "typifies the imperial pretensions of Edwardian Belfast" (commentary for Plate 72, opposite p. 63). Photograph by Philip V. Allingham 2006. The Most Honourable Frederick Temple Hamilton-Temple-Blackwood, 1st Marquess of Dufferin and Ava, KP, GCB, GCSI, GCMG, GCIE, PC (21 June 1826-12 February 1902) was a British public servant and prominent member of Victorian society. In his youth, he was a popular figure in the court of Queen Victoria , and became well known to the public after publishing a best-selling account of his travels in the North Atlantic. "Frederick Hamilton-Temple-Blackwood, 1st Marquess of Dufferin and Ava. "Quickseek.com; accessed 6 September 2006.